It is a federal holiday that is celebrated on the fourth Thursday in November. The first Thanksgiving was in 1621 when the pilgrims invited the Indians to a three-day feast to celebrate the autumn harvest. 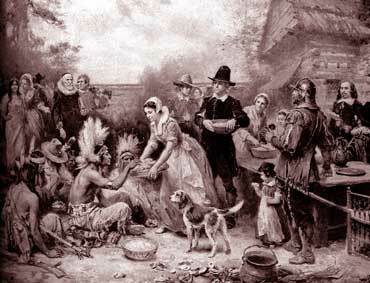 The pilgrims were a small group of people who sailed to North America in order to start a new life. 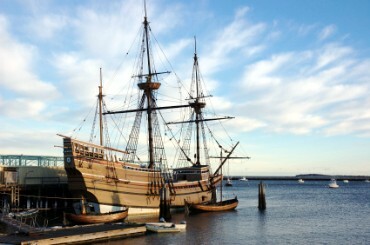 They sailed on the Mayflower ship and landed on Plymouth Rock. Copyrights to the pictures and photos on this Thanksgiving lesson belong to individual photographers. We have purchased the rights to use them. Do not copy the pictures and photos on this ESL lesson. Permission is granted to download any of the free ESL worksheets for classroom or home study. Contact Christina Niven, ESL teacher, at christina@elcivics.com. Please send corrections, comments, greetings, and requests for new lessons. Copyright © Christina Niven, 2007.